There are four different elements of this installation which, between them, make a ‘room’ for this domestic space. 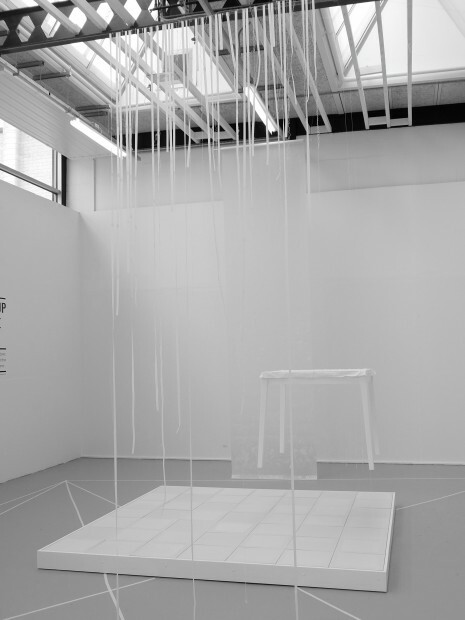 All the works of this installation – ‘stories’ – are in white. This reflective white space poses a juxtaposition between what is visible and invisible, outside and inside, the present and the past, between remembering and forgetting, what is seen and unseen, and what is known and unknown. The viewer has to pause and come up close to see what is there. Without taking time and care, the details and beauty could be easily missed. Most of the materials used are fragile, to illustrate the fragility of memory and the sensitivity of the issues they attempt to expose. The images are based on memory items, material objects including handkerchiefs and table linen, each with a personal story and identity. Cloth and textiles can trigger significant memories through the sense of touch and smell; they signify the presence as well as the absence of someone special. Reproducing visual images of these memory items aims to retrieve what is perhaps lost and forgotten, giving special value to what is perhaps not valued anymore. The physically and mentally intensive process of drawing, tracing, cutting, printing, unpicking and hand sewing takes time, valuing what was there and following the journey, making sense and making meaning and perhaps making the memories valuable again in a different way. The square floor area is approximately 2.35 m x 2.35 m, made up of 49 white ceramic floor tiles (laid 7 x 7). Each white tile has an individual screen print image in white of an ‘old’ handkerchief. There are a few blank white tiles interspersed amongst the screen printed white tiles. This is a ‘raised’ white floor set on a plinth. Each tile represents a person, an identity, a history, with its unique stories. 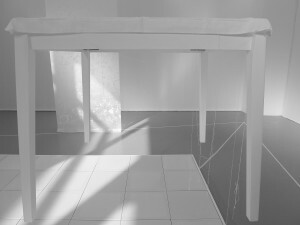 A table is suspended from the ceiling towards the back of the white floor, with the white square ‘unpicked’ hand embroidered tablecloth (600 mm x 600 mm) laid on the top (table top removed). The table is suspended so that the viewer can see at eye level the pattern at the top of the tablecloth, and some strands of cotton hanging from the bottom of the cloth. The tablecloth must hold stories and memories for someone in the past; one could smell the food and hear the conversations as the food was shared. The ‘transformed’ tablecloth is the outcome of a long process of unpicking thread by thread and tracing the history of making through time – what is left is the less visible pattern of the embroidered flowers and leaves, illustrated by the traces of holes on the cloth where the needle once went through. What is unravelled appears to be long and short stories, with a sense of mystery and beauty. 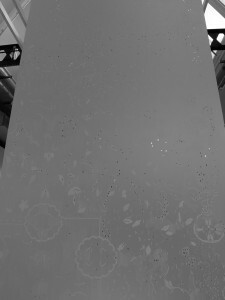 This hand-drawn memory scroll (white pencil, white crayon and white pen on roll of detail paper) is 1m wide by 6 m long hangs from the ceiling down to the floor level. It is suspended from the ceiling some distance to one side of the table, so that there is physical space for the viewer to walk in front and behind the curtain. The curtain is made of translucent detail paper (very light weight tracing paper), with delicate lace curtain patterns drawn with white materials both at the front and the back. White cotton which has been unravelled from the tablecloth is sewn into this curtain and some left hanging at the front as well as the back of the curtain. As memory unfolds with the unrolling of the scroll, the intricate details of the lace curtain are clearly visible in some areas and invisible in others. This curtain of approximately 0.75m in width and 2.5m in height, is hanging down from the ceiling to the floor, on the other side of the table, facing Curtain 1. 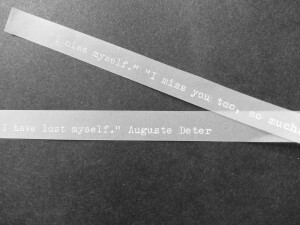 It is made up of fine, long strips of dementia ‘stories’ typed in white on tracing paper, joined together by white cotton. There are whole strings of cotton of different lengths, which have been unravelled and taken out of the tablecloth, hanging between these story tapes. The installation is site specific. Depending on the space available for the installation, the different elements can be put together in different ways. By exposure through their own sensing, questioning and exploring, the viewer is invited to experience and reflect on what is lost and what remains to be found for people with dementia and their carers.